05.18.2006 - I received a call about a Coral Snake in someone's patio. Red, black, and yellow bands, I was told, along with a black nose. That's a sure description of a Coral, and out I sped to remove the dangerous snake. I showed up to the house, but as is often the case, the snake had left by the time I arrived. I hate that. I had to drop everything and make a long drive out to the house, and now it had vacated. I scrounged around inside the patio and found nothing, and so I concluded that it must have slithered out the same way it came in, probably through a gap under the patio door. I made a last-ditch effort to search outside, but experience has told me that once a snake has vacated a scene, there's no finding it. Well, amazingly, next to the house only a few feet from the patio, I saw this snake slithering off. I was perplexed by its appearance, as I'd never seen a snake like it. I treated it with caution and grabbed it with my padded snake tongs and bagged it. I thought that it was a Scarlet King Snake. The shape, size, and color certainly matched. However, it wasn't quite the same, and the most easily identifiable difference was the black nose, as opposed to red. I took a few photos of the snake before I released it, and posted them online as a Scarlet King, perhaps with a modified nose color. 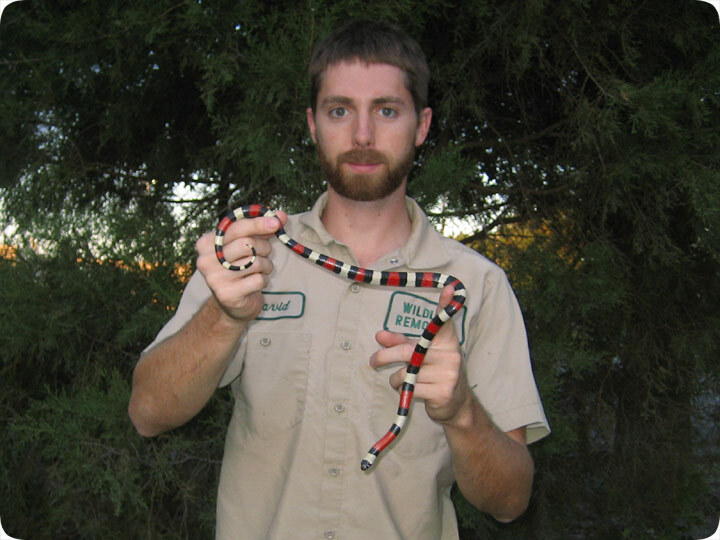 Someone quickly notified me of my mistake, and told me that I'd caught a Pueblan Milk Snake, Lampropeltis triangulum campbelli, also known as the Campbell's Milk Snake. These snakes are common pets, and it's easy to see why, given their pretty color and docile nature. They are native to southern Mexico. I don't know if such a snake could survive the Orlando winter or not, or if the habitat here is suitable. It's anyone's guess as to how long the snake had been in the wild. This was yet another released or escaped pet snake. I always suspect release, when the lazy pet owner no longer wants to care for the pet, but this snake was such a strong and crafty climber, plus it escaped from the original patio, that I believe it might have been an escapee. I was excited to catch it, as it was a new species to me, though I'd usually rather get a new native snake than an exotic.